"Our world... will come to an end on August 12th." In the wake of the second world war and the dawning of the new Cold War, the world was in the new atomic age where global destruction was a button push away. In the early 1950s, visonary producer George Pal brought a treasured collection of speculative fiction movies to life. His first, Destination Moon, based on Robert Heinlein's novel, put a man on the moon in nearly twenty years prior to it becoming a reality. His third, War Of The Worlds, pictured alien spacecraft raygunning the Earth's civilization, and would become a classic. 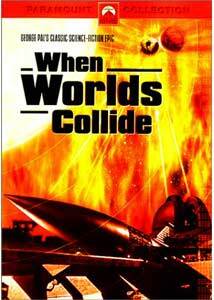 Pal's second film for Paramount was When Worlds Collide, based on the novel by Edwin Balmer and Philip Wylie, which utilized a number of fantastic special effects to tell a tale that has been reworked in the not so distant past with films like Armaggedon and Deep Impact, where Earth faces a menacing threat from celestial bodies on a collision course with the planet. An astronomer (Hayden Rorke as Dr. Emery Bronson) at the Mount Kena observatory in South Africa entrusts the top secret evidence he has collected to pilot David Randall (Richard Derr) for delivery to their colleage, Dr. Cole Hendron (Larry Keating), to correlate their findings. En route, he meets the doctor's daughter, Joyce (Barbara Rush), who assumes he has knowledge of the information he is carrying. When the truth is finally verified, it is revealed that a star and the planet orbiting it are on a collision course with Earth, having travelled over a million miles in under a week. The details are outlined at a meeting of the U.N., where the doctors' findings are ridiculed by other scientists, especially when Hedron informs them that they have only eight months to build a spaceship, a modern day Noah's Ark, that will be mankind's only hope of survival—a theory none of the world leaders will believe. With government sponsorship out of the question, Hendron goes ahead with private plans to build the ship, though financing the project means taking on a selfish millionaire by the name of Sydney Stanton (John Hoyt), intent on only saving his own hide should this catastrophe come to pass. Since there has never been a ship landed on another planet, the project is big on theory, but low on practical experience; nevertheless, work begins furiously to build the craft, and its length of track that will propel the ship into orbit. With only room for 40 passengers, the selection process will have to be made by lottery, a process Stanton fears will lead to rebellion when it comes down to who will survive. First to reach Earth will be the star's satellite, Zera, predicted to cause massive earthquakes and tidal waves as it passes, with the star Bellus following 19 days later. As time ticks by and the inevitable approaches, how will mankind face its final hours, and can the ship really execute its mission? When Worlds Collide works on many different levels. With its attention to the political and social issues that would surround such an event, the film covers a lot of ground. Since it was made nearly two decades before a man would ever set foot on the moon, the speculative nature of a manned mission to another world is also addressed. While the extent to which many of these issues is touched upon isn't deep, there is at least some indication of the breadth of the dilemma being faced, and the human element is not sacrificed for the sake of special effects, as the central love interests and personal sacrifices are also delved into. Acting has that somehwat superficial matter-of-factness to it that is predominant in genre films from this era, but which also give them their unique character. Sets have all that great 1950s technology going for them—just check out the unwieldy camera controls on the spacecraft. The Oscar®-winning special effects are simply fantastic, and while their realism pales with modern methods, they are a marvel to behold—the sight of tidal waves in Times Square and Manhattan underwater are surely landmarks in visual effects history. The film's brilliant cinematography was also nominated for an Academy Award®.When Worlds Collide is a window to the world of the early 1950s, where much of what we now take for granted was still considered fantasy. This is a must for any fan of classic science fiction. Image Transfer Review: Overall, When Worlds Collide looks terrific, with rich color, solid black levels and very good detail rendering. There are some instances of ringing, though I'm not certain where these originate, as they don't look like typical edge enhancement problems. There is some brightness pulsing in a couple of areas, but for a film this age, it holds up remarkably well. Grain is subtle, outside a few scenes where it is more predominant, but these look like they are sourced from an alternate print, as detail also degrades in these isolated shots. Audio Transfer Review: Mono audio is in great shape with only minor distortion on occasion. Frequency range is well covered for a film of this vintage, and dialogue is easily discernable. A French dub is also available. Extras Review: The film's theatrical trailer is the lone extra. When Worlds Collide is a must have for any vintage sci-fi fan. The combination of great speculative fiction, plus superb special effects for the time, make this a classic. The story is engaging and well developed, and the 1950s view of the future of space travel and global calamity is vital for collectors of the genre. Highly recommended.